Guest Blogger Emily Johnston is a photographer who loves the sense of freedom travelling gives her. In this episode she talks about the dangers of comparison. 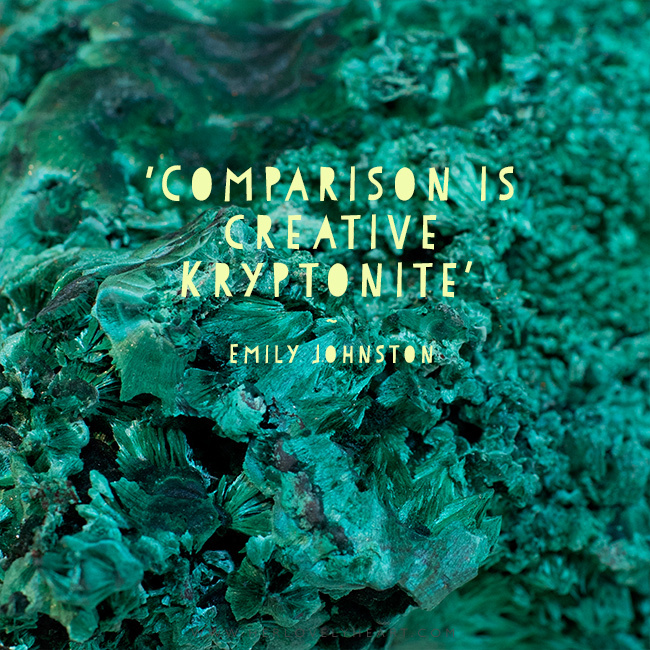 Comparison is creative Kryptonite because what makes you unique is your own interpretation of things. Your unique factor is where your gifts, talent, and acquired skills intersect with your passion. What makes passion? Life experience and the way you choose to interpret it. Mix these ingredients properly and you have an original expression that results in an original approach, incomparable to anything or anyone else, as nobody else has your history, hence nobody else has your reflection and expression and heart-motivation. We all start by modelling, copying, and shadowing those who have greater mastery than us, but somewhere along the way you find yourself. It’s never been done the way you do it. If it’s you – it’s new! It’s a voice, not an echo; substance, not a shadow. Nothing will ensure you sabotage this creative uniqueness, and simultaneously feel powerless, than spending your time comparing yourself and your work to those of others. Especially when we compare our behind-the-scenes with everyone else’s highlights, that are often a tweaked, edited, retouched and polished versions of the truth. Do you ever find yourself with a genius idea, but paralysed by the thought ‘but I don’t know how to do that…' Here’s the truth. 99% of what you need to do to grow both personal and professionally in this life time requires you to do something you’ve never done before. It’s the beautiful common denominator of self-evolution. Therefore if you don’t know how to do something, guaranteed someone else does. Use the endless resources you have at your fingers tip – Google, email, phone, Skype or even arrange to meet someone in person face-to-face (old school I know!) Never before has such vast knowledge and deep know-how been so readily available, 24/7 and largely, for free. Trust me when I say if you can dream it you, you can make it happen. Go pro or go home. This is a quote from Steven Pressfield’s book The War of Art . In any given moment, you’re either operating like an amateur or a pro. An amateur does things half-heated. They treats their business like a hobby. They don't suit up and show up every day – no matter what. They allow their ego to heckle them with such thoughts as ‘this will never work… no one cares what you have to say anyway. It’s all been done before…' stopping them dead in their tracks for days, weeks and months. A Pro, on the other hand, does anything with excellence. They treat their business, however small, with dedication and respect. They play to win: financially, spiritually and emotionally. They, of course, hear the same fear-based thoughts in their head but get back to work either way. Don't be seduced by the ‘overnight' success stories. Most profitable, successful businesses have grown slowly, steadily and organically over time. Discover your own rhythm. Never do anything ‘just for the money'. Do it to make a difference. Do it because your soul says so. Do it because it lights you up from the inside out. Either love what you do whole-heartedly or don’t do it at all. Nothing will cost you more in terms of spiritual and financial wealth than saying yes to something you really don’t want to do or doing it because someone else thinks you should or because you are trying to prove something. Remember no other person ever has, or ever will, have the unique blend of talents, strengths and perspective that you have. Don’t spend time comparing yourself to others. Star in your very own comic book. After all you are a creative superhero.